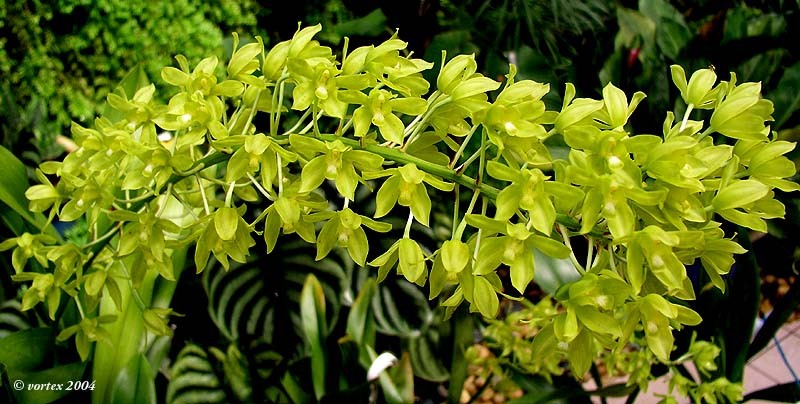 A large to giant sized, hot growing epiphyte with ovoid to ellipsoid, laterally compressed pseudobulbs carrying 5 to 8 broad, coriaceous, linear-ligulate, dull green, basally clasping leaves that blooms on a basal, 4' [120 cm] long, erect to arching, many, waxy flowered, racemose inflorescence arising on a mature pseudobulb that has imperfect flowers at the bottom few rows and many , waxy, color variable, heavy textured, campanulate flowers occuring in the late spring or summer. It can become a huge plant, and is from Borneo, the Lesser Sunda Islands, the Moluccas, The Philippines, Sulawesi, the Solomon Islands, the Bismark Archipelago, Papua and New Guinea, Fiji and Santa Cruz Islands and is found at elevations of sea level to 100 meters always close to the coast, overhanging beaches, lagoons, and coconut plantations on tree trunks and branches and likes bright light. 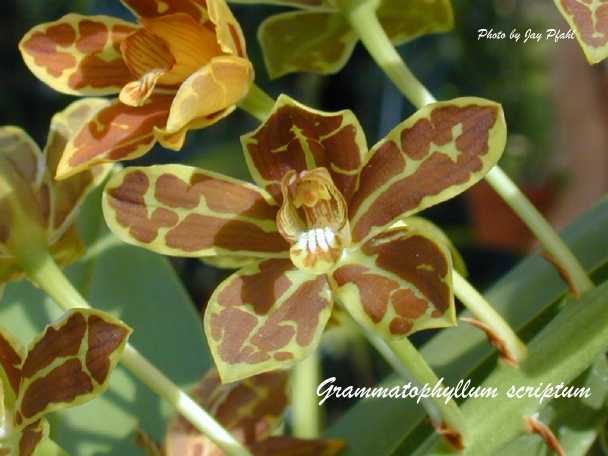 The Amboin Island native people make a paste from the pseudobulb of G scriptum to heal sores. 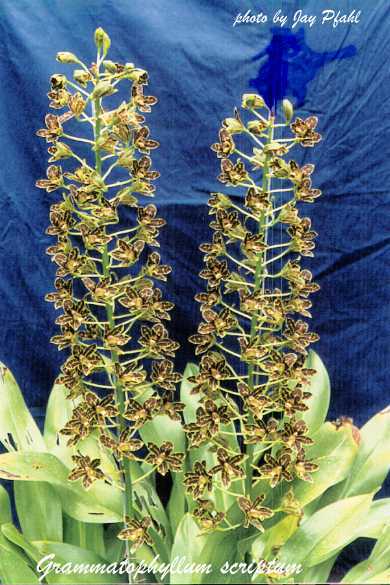 Other peoples within this species range use this plant to cure intestinal ailments and a cleanser for worms. 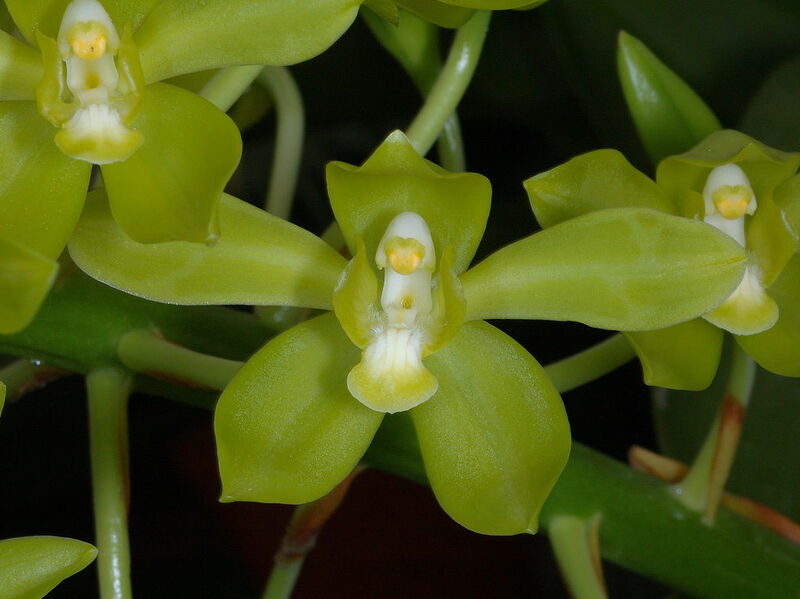 People of the Spice Islands have been known to make a love potion from the seeds of this species. 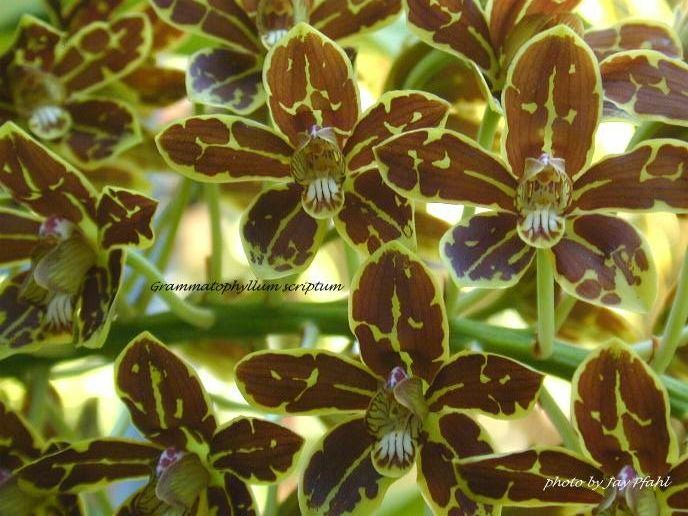 Inflorescence Photo courtesy of Nik Fahmi and his Vortex Orchid Page.